Several months ago I did a devotional for a ladies group and I shared very personally on what I had been going through in trying to establish balance in my life. I would like to share the collection of excerpts from other authors as well as my own thoughts here in hopes that I can encourage other women who feel as I did/do. 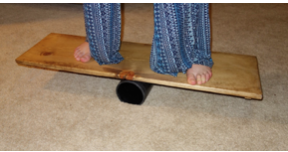 We began with an attempt to balance on a board that had been laid across a cylinder something like the one pictured here. Balancing on the board was hard. No one could balance for more than a few seconds. You have to take into account what you are balancing on, which way to lean, how to best keep it balanced while doing other things. After a while it would get quite exhausting. This is our lives. We try to balance out being a good wife, mother, employee, friend, being involved in ministry. That’s like not just balancing on one board but stacking them up and balancing four or five boards all at once.